Priority Oregon posted an ad titled “Scary” on its Facebook page on Aug. 17, 2018. For much of the summer, the race for Oregon governor has been marked by attack ads. Now, the campaign of Democratic Gov. Kate Brown says opponents have gone too far. In a letter sent to Oregon television stations on Monday, an attorney for Brown says a recent ad by the group Priority Oregon broke the law by including an outright lie. Brown’s camp is demanding the stations cease airing the ad, though there’s no legal requirement they do so. 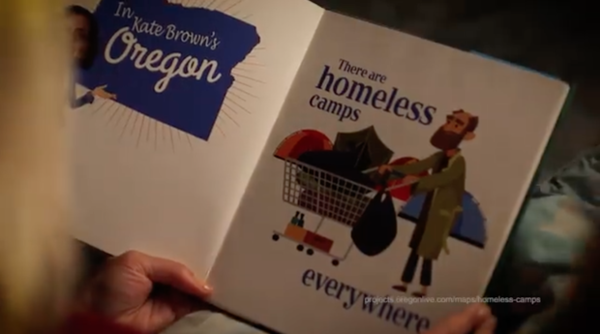 The ad suggests Brown has allowed homelessness to explode, children to go hungry and seniors to be abused. At the end of the spot, the woman reading the story says, “And you can sell drugs while running a day care.” She points to an illustration of a seedy-looking figure holding a baggie of what appears to be cannabis, while children play in the background. That’s where Brown’s campaign draws the line. The letter Wilson sent to TV stations on Monday includes a reference to state administrative rules that say people who hold a medical marijuana license, or who grow or distribute marijuana, cannot be certified as a child care provider. “That statement is categorically and unambiguously untrue: It is illegal to sell drugs at a child care center in Oregon under numerous provisions of Oregon law,” Wilson’s letter says. In a phone conversation, Wilson said he was “at a complete loss” as to where Priority Oregon was pulling its claim. The group’s executive director, Erica Hetfeld, said it’s a matter of public record. “At the very heart of it, all of this stuff happened under Gov. Brown,” Hetfeld said. “What we said in the ad was completely true that it happened under her watch.” The “Scary” ad, she said, was slated to run “pretty far and pretty wide.” Hetfeld hadn’t heard from any television stations about the ad as of Monday morning. Though Brown’s campaign has demanded TV stations pull the ad, Wilson acknowledged they don’t have to. Under Oregon law, stations in most cases aren’t liable for airing false campaign statements knowingly created by another party. Instead, Brown’s legal recourse is to file a civil complaint against Priority Oregon. Wilson would not say whether there are plans to do so. The dust-up is the latest in the escalating rhetoric this summer from supporters of Brown and state Rep. Knute Buehler, her Republican gubernatorial opponent. August is often a sleepy time for campaigns, but the business-oriented Priority Oregon and a group affiliated with Brown, Defend Oregon’s Values, haven’t been shy about trying to grab voters’ attention with unflattering TV spots.